Computex 2017 is underway in Taipei and we’ve already heard news of the new ASUS Flip C101. It’s not too surprising to see new Chrome OS devices announced at the annual technology show. At the same time, we weren’t expecting any jaw-dropping Chromebooks to show up here either. Acer apparently, had other plans. 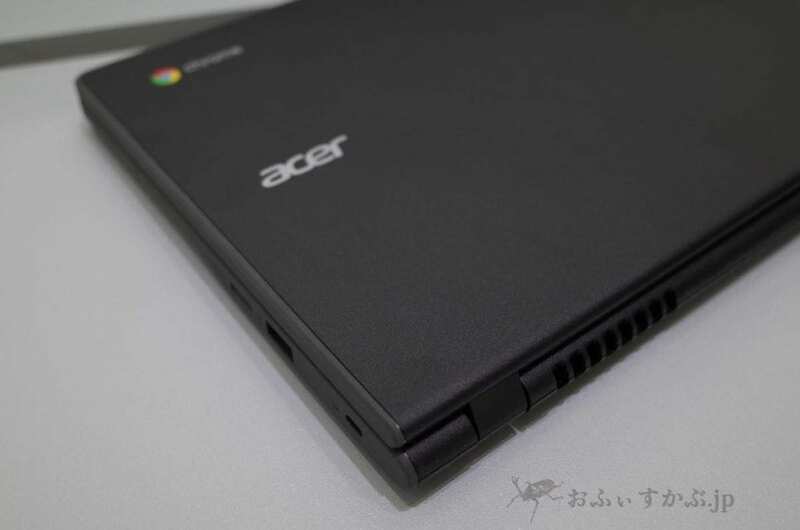 Suzuki Akifumi (@SukuziAkifumi) of office-kabu.jp is on the ground floor in Taipei and has shared images of a new, 11.6″ device from Acer that is unlike anything we’ve seen. No, it’s not a convertible nor is it a tablet or detachable. Actually, there’s nothing new about the hardware on this Acer. What is new is the combination of internals and chassis. This new offering from Acer is an 11.6″ device with military-grade specs. Again, nothing new. What is unique is that this device is touting Core i5/i7 processors and up to 8GB RAM. That’s right. Acer’s latest Chromebook is an 11.6″ clamshell built to take a beating and has the guts of a Chromebook Pixel. According to Suzuki’s photos this device is outfitted with an odd array of externals. High-end Chromebook these days are offering very few ports. Mostly USB-C, a microSD and if you’re lucky a 3.0 USB-A. Not this Chromebook. On it you can see 2 USB-A ports and only one of them looks to be 3.0. We also have a single USB-C and a full-size HDMI port. Apart from that there is a MicroSD and your usual 3.5mm headphone jack. Acer is also advertising a “unique liquid drainage design.” A.K.A., spill-resistant keyboard. Most intriguing about this Chromebook is the chipset. The image from Acer’s booth advertised 7th Generation Intel Core i3/i5. That’s Kaby Lake. However, Suzuki was wise enough to pull up the firmware screen on this device and found a board by the name of ‘Lars’. Now, that may not sound familiar to you but ‘Lars’ is the same board found in the Acer Chromebook 14 for Work. The 14 for Work is a powerhouse with a glass lid designed with enterprise execs in mind. This creates a bit of confusion around this Chromebook. 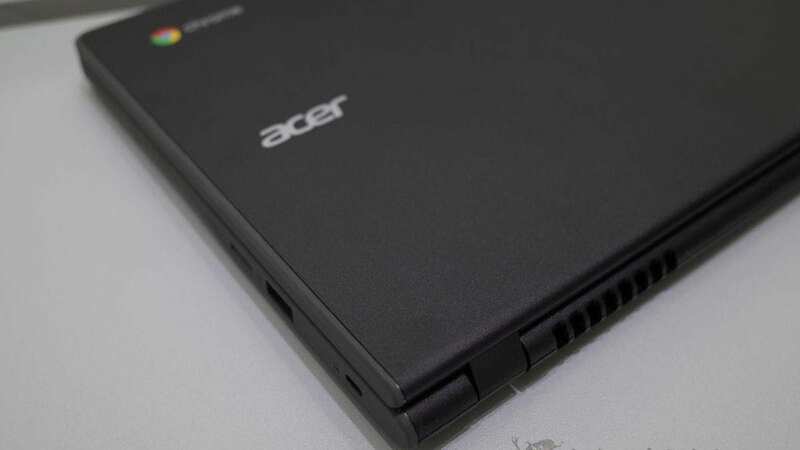 The Acer 14 for Work is a 6th Generation Skylake which should make this new device the same. It is possible that developers hurried this display model and crammed the 14’s board in it but reps in Taipei repeatedly told Suzuki the new Acer is Skylake. Either way, this is a very unique Chromebook and offering 8GB RAM honestly gets me a little giddy. Early suspicions point to this Chromebook being an EDU device. It’s common to see older ports on an educational device since most institutions still have classrooms full of legacy hardware. The question is, what students or schools for that matter would be forking out the kind of cash it’s going to take to buy this thing? My guess – and this is totally just my gut talking – is that this is actually a Chromebook that will be marketed to enterprise customers. Here’s how I’ve come to that conclusion. First, the money. Even at the bare minimum a Core i5 Acer 15 was $500 brand new and it wasn’t military-grade. This new Acer 11, with a 6th or 7th Generation Core processor and all that RAM isn’t going to be under $600. No way. That’s a lot of cash for a school to be forking out for a Chromebook of any kind. Second is the build. The combination of powerful guts and legacy ports screams enterprise to me. The need for compatibility is just as much an issue for corporations as it is for schools. Decades of legacy hardware still in use, these devices need access to that. That, combined with the rugged build, brings to my mind a company that has fleets of workers that are on the go and hands-on. They need devices that can handle the workload but won’t succumb to the daily rigors. If I owned a telecom company, for example, I wouldn’t want my IT department doling out HP 13s to my field workers. Not a good investment. That’s my opinion, for what it’s worth. I have been in touch with Suzuki and he is going to do his best to get some more hands-on time with the Acer 11 and see if he can get some more details about this very intriguing Chromebook. We look forward to hearing more. For full details and more photos head over to office-kabu.